This story was put together almost completely by Findadeath friend Gary Thelen. 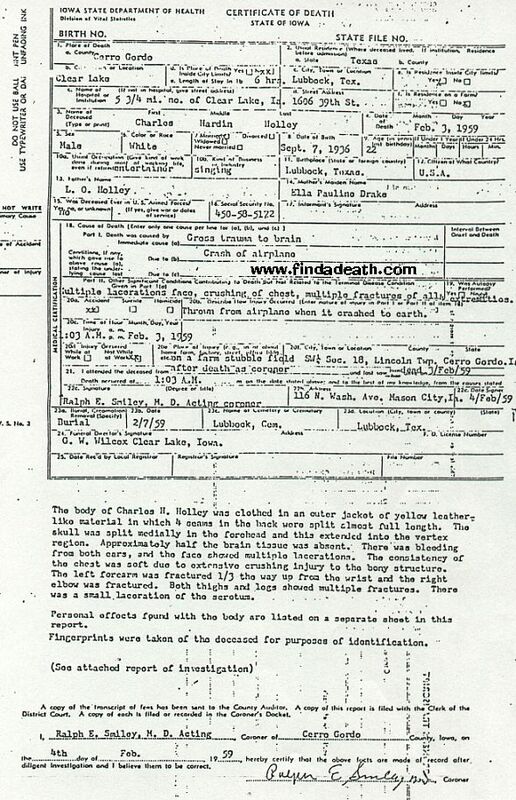 Most of the photographs, text and information came directly from Gary or sources suggested by him. We owe him much gratitude. Thank you, Gary. 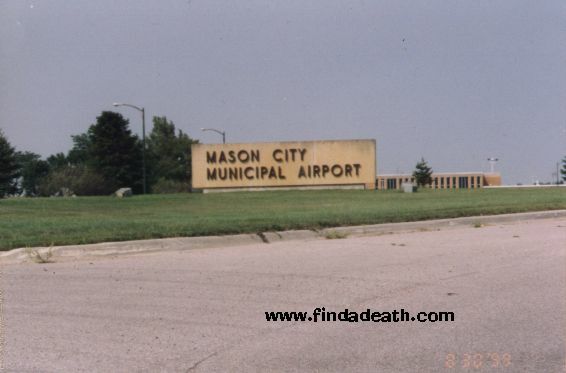 to the Mason City Airport. The National Weather Service had issued a storm warning, but it had not been received by the pilot or by Jerry Dwyer, the owner of the Dwyer Flying Service. According to Findadeath friend Kevin Clarke and others, the story is false about the plane being called American Pie, see the story here. 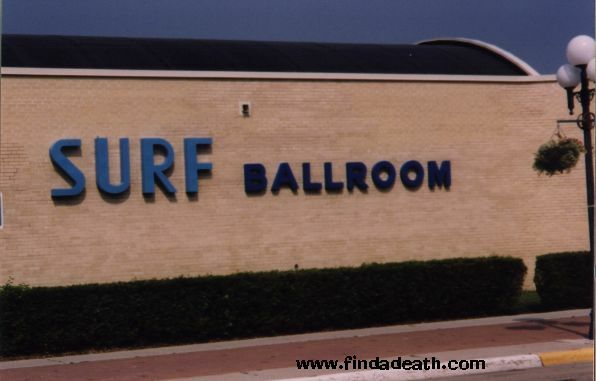 The tour had been called “The Winter Dance Party.” Concert tours were profitable and Buddy Holly needed the money. He was recently married with a child on the way. Buddy had broken up with his group, The Crickets, and had left his record company. Joining him on the tour was former Cricket, Tommy Allsup (a friend from his hometown of Lubbock, Texas), Waylon Jennings, and Dion and the Belmonts. 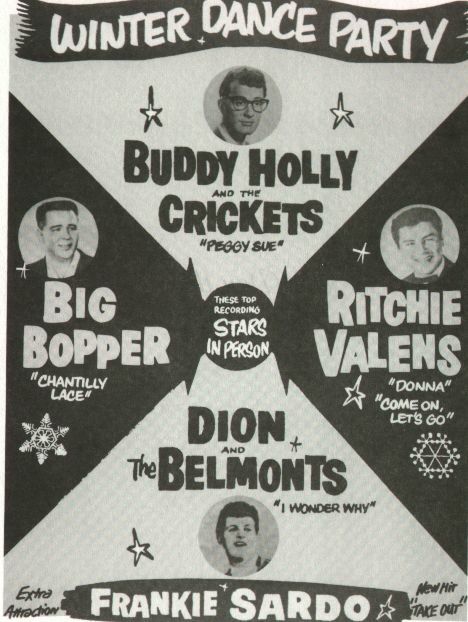 The headliners were Buddy, Ritchie and the Big Bopper. It was a grueling tour of one-night stands in the middle of winter, in the cold and snowy American Midwest. The bus kept breaking down and had no heat. One member of the group, drummer, Carl Brunch, suffered frostbite. Ritchie Valens and the Big Bopper caught colds. 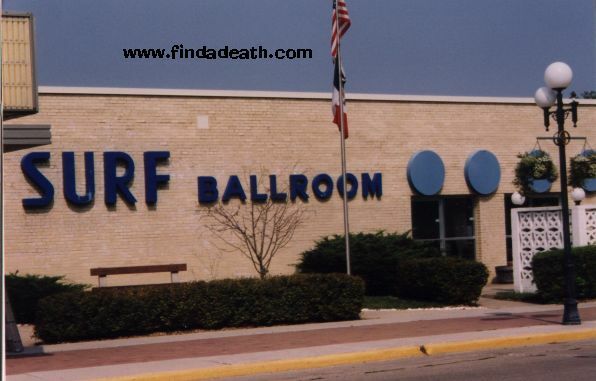 Their last concert was at the Surf Ballroom, on Monday the Second of February. Buddy was tired of the malfunctioning bus and did not want to take it to the next stop on the tour, Moorhead, Minnesota, several hundred miles away. He arranged to charter a plane to Fargo, North Dakota, the nearest airport to Moorhead. Two other members of the group could go with him at $36 per person. Dion balked at paying the tab. Waylon Jennings wanted to fly with Buddy, but exchanged his seat with J.P. Richardson because he had a cold. Tommy Alsup was included in the group, but Ritchie Valens offered to flip him for the seat since he was ill. The local host of the “Winter Dance Party,” Bob Hale, flipped the coin. Ritchie called “Heads.” and won the toss. Years later, Tommy Alsup would open a dance club named “The Head’s Up Saloon” to commemorate this life-saving coin toss. 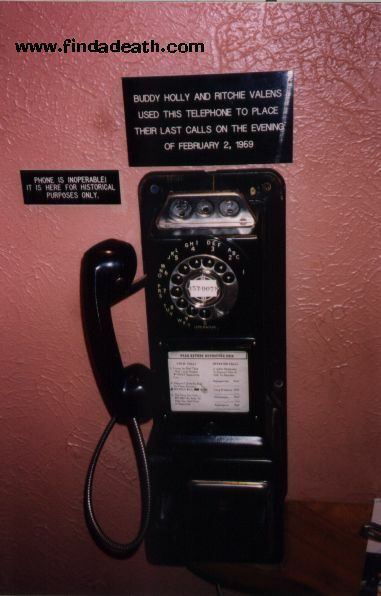 Buddy used the payphone in the lobby to call his wife, and Ritchie used it to call his brother. Both complained about the miserable conditions of the tour, and spoke of future plans. Before departure, Buddy teased his friend from Texas, Waylon Jennings, because he wasn’t joining him in the plane. 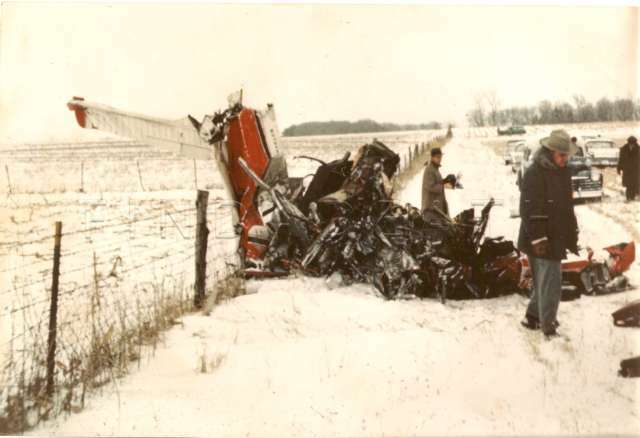 Buddy said, “Well, you’re not going on that plane with me tonight?” Jennings replied, “No.” Buddy’s reply was, “Well, I hope your old bus freezes up again.” Jennings snapped back, “Well, hell, I hope your old plane crashes.” Both events occurred that night. 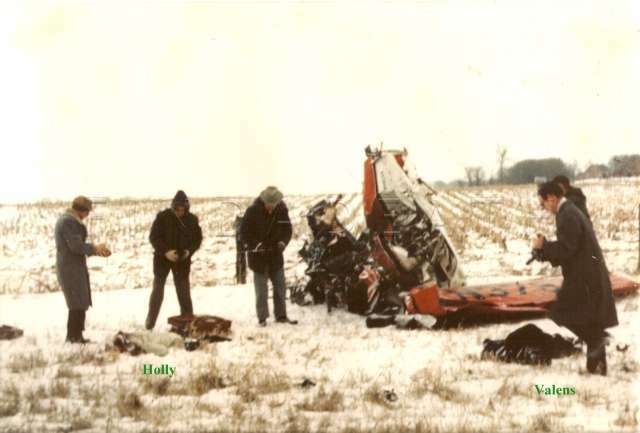 At about 1:00 am in February 3, 1959, the plane carrying three of rock music’s brightest stars took off into a blinding snow storm and crashed into Albert Juhl’s corn field about fifteen miles northwest of Mason City in Cerro Gordo County, Iowa. 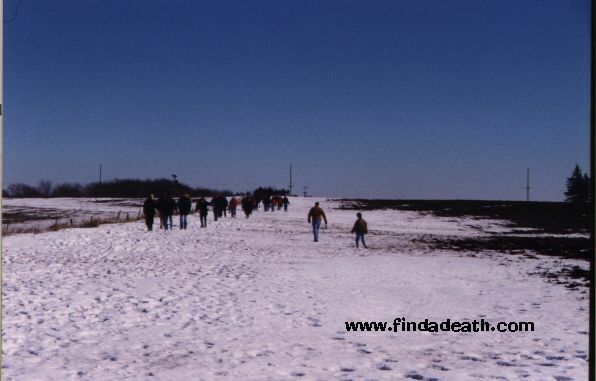 Here’s a shot of the same field, taken in 1999. Buddy Holly, Ritchie Valens, Jiles P. Richardson, and pilot, Roger Peterson, were dead. in that snow-covered field, about a quarter mile from the nearest country road. 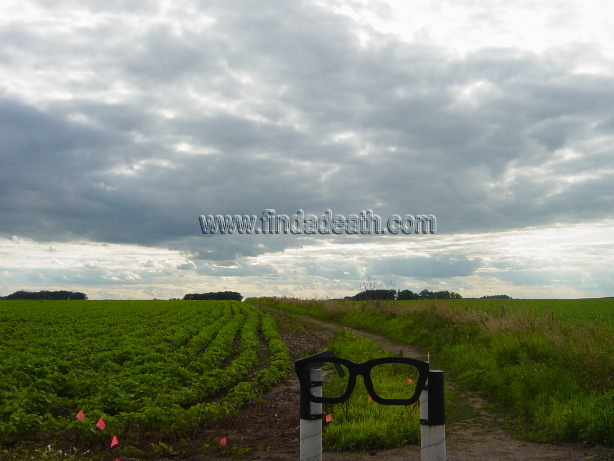 “The wreckage lay about 1/2 mile west from the farm home of the Albert and Delbert Juhl. The main part of the plane lay against the barbed wire fence at the north end of the stubble fields in which it came to earth. It had skidded and/or rolled approximately 570 feet from point of impact directed northwesterly. The shape of the mass of wreckage approximated a ball with one wing sticking up diagonally from one side. 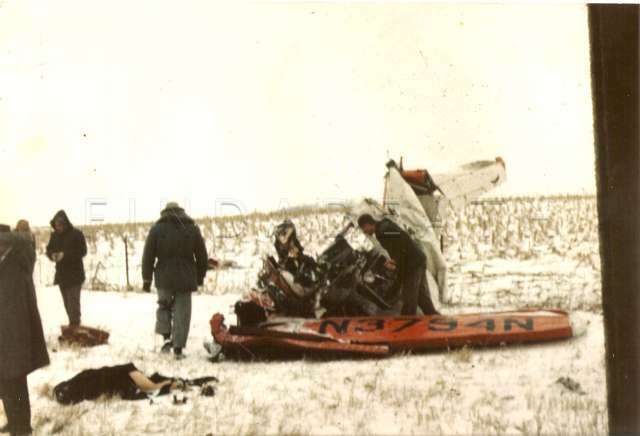 The body of Roger Peterson was enclosed by wreckage with only the legs visible sticking upwards. Richard Valenzuela’s body was south, lying prone, head directed south 17 feet from the wreckage. Charles Holley’s body, also in the prone position, was lying southwest, head directed southwest, 17 feet from the wreckage. 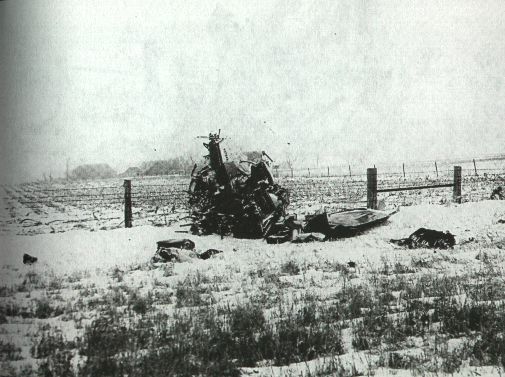 J.P. Richardson’s body, lying partly prone and partly on the right side, was northwest of the wreckage, head directed south 40 feet from the wreckage, across the fence in a cornfield. 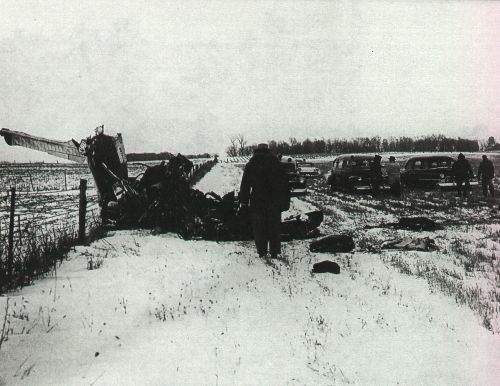 Fine snow fell lightly after the crash had drifted slightly about the bodies and wreckage. Some parts of each body had been frozen by ten hours’ exposure in temperature reported to have been near 18 degrees during that time. Findadeath friend Steve Cragg sends this: when I was 17, I attended a Holly convention in TX, and purchased these pictures out of a hotel room. I remember it being very hush hush.. lol. Anyway, I have had them in a folder for years, and was just thinking of them as I was perusing Findadeath. Thank you, Steve. These images are incredible. Their bodies hadn’t been removed yet. The three bodies on the ground were removed. Peterson’s body was removed after permission was granted by the inspector for the Civil Aeronautics Board and Federal Aviation Agency. Deputy Sheriffs Wm. McGill and Lowell Sandquist used metal cutting tools to open a space in the wreckage. 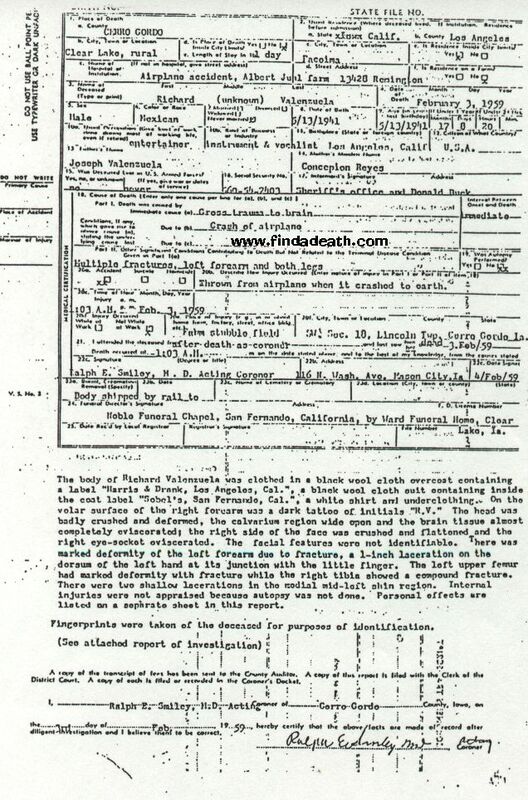 For some really gruesome reading, check out the fine print, on these death certificates. His scrotum? Ouch. Buddy had $193.00 on him, and unless I’m wrong, the coroner removed $11.65 of it, for his own fees. Tacky, or what? Buddy also had a pair of cuff links and the top portion of a ballpoint pen on him. Peterson was taken to the Wilcox Funeral Home and Richardson was taken to the Ward Funeral Home. No word on where the others were taken, specifically. 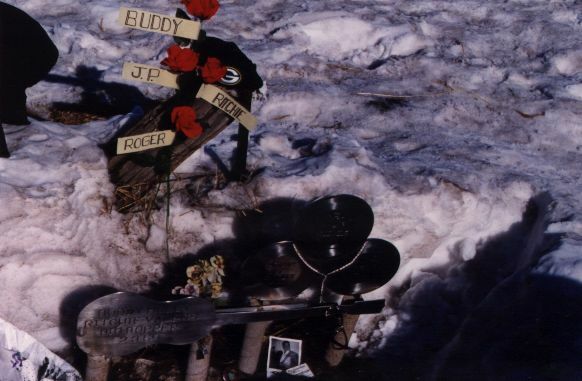 On Friday, Feb. 6, 1959, Roger Peterson was buried in the Buena Vista Memorial Cemetery, in his hometown of Alta. 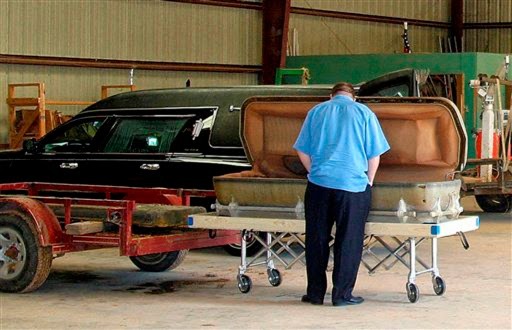 Richardson’s wake was held in the Broussard’s Funeral Home, in Beaumont, and he was buried in Beaumont, Texas. Private soldier Elvis Presley and Colonel Tom Parker sent yellow roses to his funeral. Richardson’s son decided to dig up his old man, and have his first look at ol pop. Jay Richardson was born three months after his father’s death, and had his father exhumed, reautupsied to dispel any rumors of foul play on the plane, and reburied in a GOREjus new casket. See the fascinating slideshow now. Has the whole world gone Death Hag? Thanks to everyone who sent me information, but especially Joab for this particular link. Did anyone else feel gypped when we didn’t get a peek? 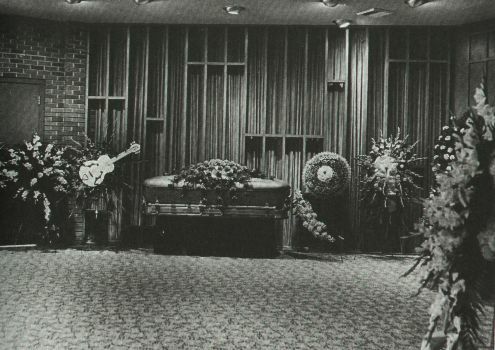 On Saturday the 7th, Ritchie Valens’ body was taken from the Noble Chapel Funeral Home in the San Fernando Valley, to San Fernando Mission Cemetery. His body was driven in a copper colored hearse. My friend Lisa Burks assembled this wonderful tribute to Ritchie and the film LaBamba. Buddy was also buried on the 7th. Services were held in Lubbock, Texas, at the Tabernacle Baptist Church. Over a thousand mourners attended the service, but his widow did not. She later lost the baby. 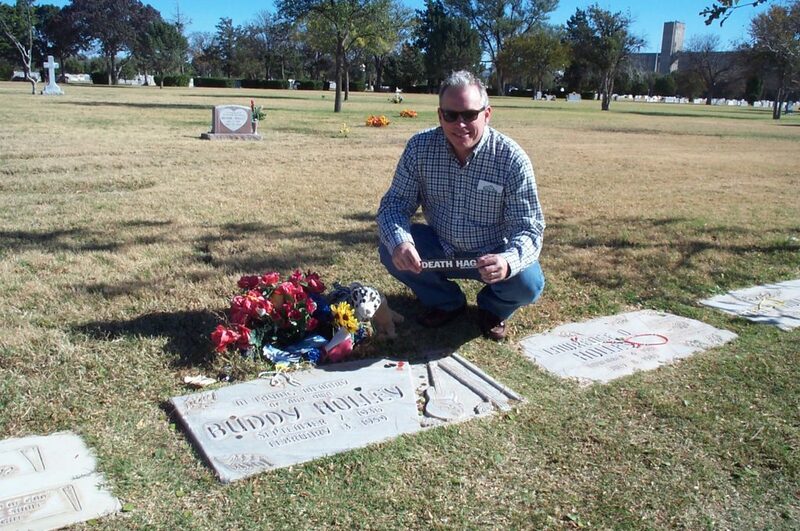 Findadeath friend Robert Workman visited Buddy’s grave. The “Winter Dance Party” tour continued. An unknown singer named Bobby Vee was asked to open the concert in Moorhead, Minnesota. Two other new rock singers, Fabian and Paul Anka, were brought in to replace the recently deceased singers. The show must go on, regardless of circumstances, and it did. That spring, after the thaw, the Juhl’s planted hay in the field where the plane crashed. They found lots of plane parts, a few body parts, and a few personal items, that were placed in an envelope in the county courthouse. Tourists continued to hound them, and they were more than happy to take them out to the crash site. Some of the lucky few were given souvenir plane pieces. Life is fragile, fate is fickle. We can only imagine what might have been and continue to listen to the music. The music makers suffered a terrible tragedy on that cold, snowy night in rural Iowa, but their music has made them immortal. Don McLean wrote a hugely famous song that reached #1 in 1972, called “American Pie,” dedicated to the victims of that plane crash. Relatives of Buddy Holly are suing MCA Records, alleging the company hoarded royalty payments, forged contracts and illegally produced albums. His widow, brothers and sister claim MCA conned Holly’s parents into signing an agreement for rights to his music. 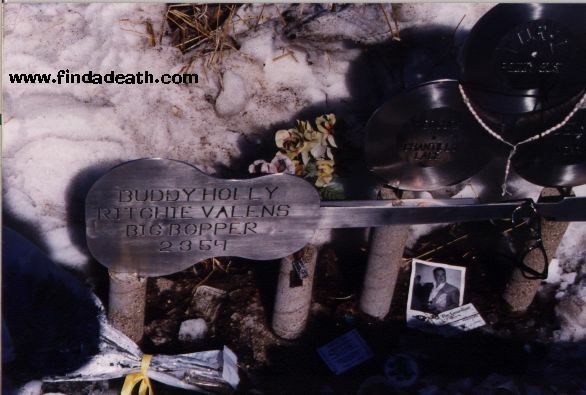 In 1988, Buddy fan Ken Paquette, built a monument to the singers, from stainless steel, and placed it at the crash site. The current owners of the land also planted 4 trees in memory of the victims, but they all died. Here’s a better view of it. 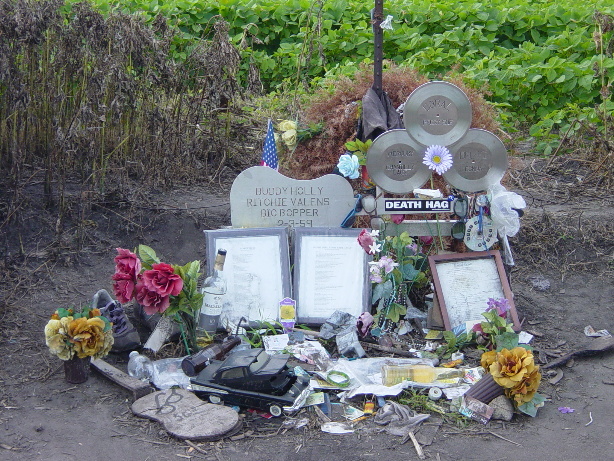 Kathleen Campbell sent this photograph of the memorial at the crash site, as well as a very unusual tribute – the crash scene as seen through Buddy’s glasses. Trivia: In 1980, someone found Buddy’s glasses, four dice, and the Big Bopper’s watch, in an envelope in the county courthouse. These items were returned to the families. 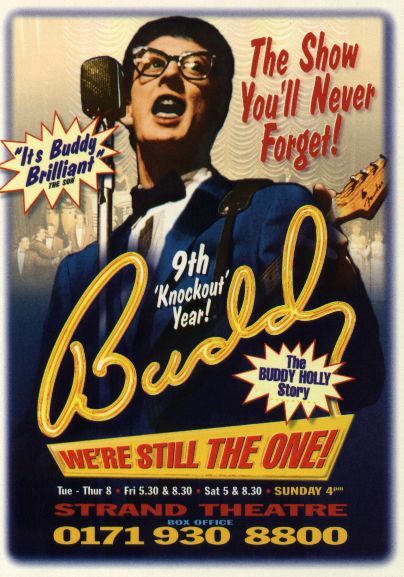 Trivia: for no good reason, here’s the poster from the “Buddy” show, still running in London’s West End. “My name is Robert Due. My mother’s sister is Adrien Richardson. She was J.P.’s (The Big Bopper) wife. 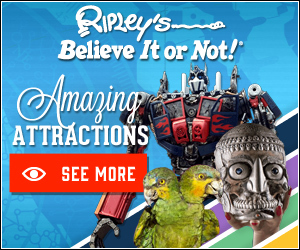 Thanks for placing J.P. Richardson on your web page. It was sent to me by a friend that came across it. You have done a great job. J.P. was my uncle. I was just 7 years old when he passed away, but I do remember him pretty well. If there are any pictures or things you would like to ask, just ask.” How cool is that? What a great thing to happen. I am truly honored. February 2002, sent in by Findadeath.com friend, Coffee: Hi, I just read your story about the Big Bopper and wanted to tell you this. In the early 1970’s I was working for Sears in Beaumont (my home town). My job was working with the contractor’s who did installing work for Sears. One of the contractors was the husband of the widow of the Big Bopper. He had taken care of and raised his wife’s 2 children from her marriage to Mr. Richardson who were very young when he died. The older child was a girl and the younger a boy. The girl grew up to resent her mother and stepfather and moved out of the house, the boy was still living at home. The girl convinced the boy that their parents owed them big money from Mr. Richardsons death. So, together they sued the parents who had loved and taken care of them. They sued for the monthly Social Security money that minors get when a parent dies. Please check this out to see if it is true. I just thought you would like to know. 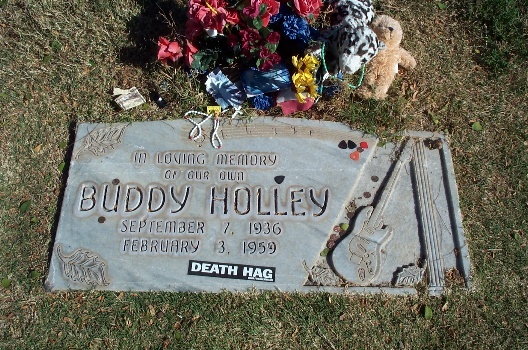 December 2002, from Findadeath.com friend Jimmy: “Just thought you might like to know that Gary Busey, who played Buddy in The Buddy Holly Story, bought one of Buddy’s guitars at an auction in New York back in 1990. 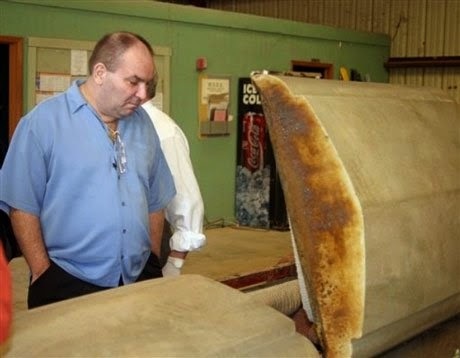 I believe he paid about $242,000 for it. Also The Rock and Roll Hall of Fame bought a pair of his glasses for like $25,000. Hope this is useful. Thanks, Jimmy. Thank you so much, Graham. 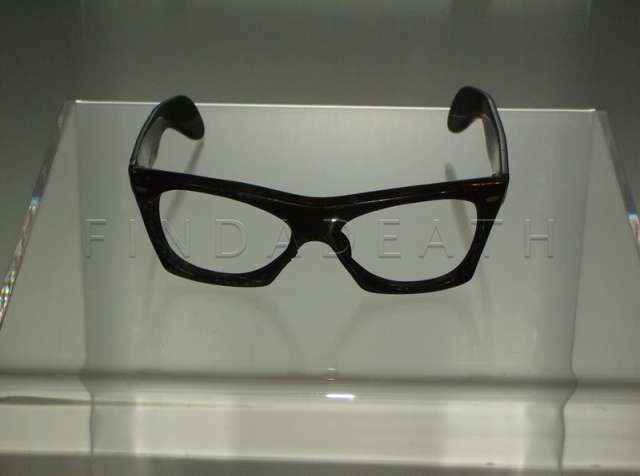 I just read the American Pie piece, and saw the Buddy Holly glasses in the Los Angeles Hard Rock cafe. They are there with Elvis’s glasses and a microphone from one of them too. If they aren’t in that HR cafe, then go to Vegas as I know I’ve seen them, and those are the only two HR cafes I’ve been to. Natalie from Pittsburgh. June 2012 Findadeath friend Kevin Workman sends this: I was just in Lubbock this weekend visiting from Houston. I went to the BUDDY HOLLY MUSIC CENTER which is a museum dedicated to Buddy and his music in a renovated Lubbock rail station. Inside is a display of the actual glasses Buddy was wearing when his plane crashed. 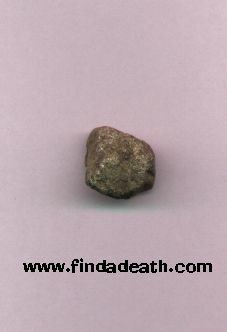 As noted in your story of him, they were find in 1980 in an evidence room and returned to the family. Here is a picture of the glasses on display at the Center. 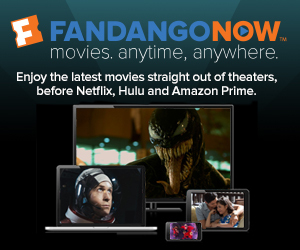 I stumbled across your site last week and am fascinated. I wondered if you knew that Paul McCartney owns the publishing rights to the Buddy Holly catalogue of songs. Also, the Beatles got the idea for their group name from Buddy Holly and the Crickets, and the British group The Hollies (“Long Cool Woman”, “Bus Stop”, etc.) named themselves after him as well. No matter what Don McLean says, the music never died.